Driver Elementary invites the community, former students and staff to join them Tuesday, May 8 at 6 p.m. for a special closing ceremony. A special cake-cutting ceremony at 5:45 p.m. will be held for participants and guests. Driver Elementary School will be closing its doors on June 15. Students and staff will relocate in September to the newly constructed Florence Bowser Elementary School. The Driver building will be used for parent and teacher resource centers, and possible alternative programs. No changes are being made to Staff Blogs or the Student or Staff Portals. The division and school websites were last updated in 2011. We are expanding our relationship with School Messanger, which has provided the division’s parent notification system since 2012. School Messenger will now be hosting the new sites and providing support. … Are you interested in spending two weeks in Italy as part of the 2018 Suffolk Sister Cities’ Summer Youth Exchange? … Are you interesting in hosting an Italian student ambassador here at home? … Are you interested in attending the Sister Cities International Youth Leadership Summit? Read this PDF for details and an application. Enhance your interview skills with employers from the Hampton Roads area. Click the link below to view the brochure for more information. 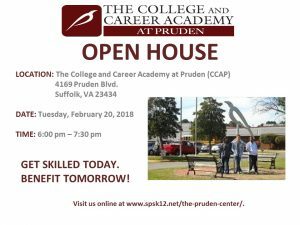 Come learn more about opportunities at the College & Career Academy at Pruden. Congratulations to 15 division employees who have been named winners of the Superintendent’s Star Award for First Semester 2017-18. A recognition reception will be held on Tuesday, February 6 at Creekside Elementary School. Judges consider initiative, school spirit, creativity, commitment, and attitude to recognize those who are making a real difference in the lives of students. A total of 15 staff members — out of 69 nominees — were selected as top honorees for the Star Award recognition. Andre Paquette was nominated by parent Samantha Linneman, who said he “provides the perfect blend of structure, support, and discipline that kids in a music program need while instilling the work ethic required to be successful.” Paquette was applauded for his willingness to work with individual students beyond school hours as they prepare for district band auditions and school concerts. His nominator said he “teaches all the subjects rolled into one” … teaching math when student musicians figure out rhythm patterns and count out beats per measure… teaching foreign language by providing translations for musical terms shared by the composer, like “fortissimo” to direct them to play very loud … and teaching history so students will understand the times and setting of specific compositions. Paquette “gives kids the gift of music,” Linneman explained. When many band students pick up an instrument for the first time in sixth grade, it’s quite an undertaking for them to decipher visual notations from sheet music to finger movements on an instrument to actually creating pleasantly audible sounds. Linnemann said resource teachers whose subjects do not focus on SOL scores often don’t get recognized for their contributions to students. Paquette “has significantly impacted my daughter by encouraging and supporting her development” as a musician, a student, and a young person. Second semester nominations for the Superintendent’s Star Award program are due by March 31. Link here for details on the award program. Link here for the NOMINATION FORM. Are Your Teachers in This Grown-Up Spelling Bee? Can you spell F-U-N? Then join us for the 2nd Annual Grown-Up Spelling Bee presented by the Suffolk Education Foundation to benefit Suffolk Public Schools. The Grown-Up Spelling Bee will be held Saturday, Feb. 10, beginning at 2 p.m. at King’s Fork High School. Teams of three adults will work together to spell words and compete for the coveted title of “Best Spellers in Suffolk.” Teams that face elimination on can continue the fun by buying a “spell check” or “stinging” another team by passing on a difficult word. Teams are invited to wear costumes — the more creative, the better! A buzzing hive of spectators will vote for the best team costumes. The 1st Annual Grown-Up Spelling Bee teams raised close to $10,000. Tickets are $5 a person … Children 8 and under are free. *NOTE: Weather Make-Up Date – Feb. 17. Thanks to all who supported the Suffolk Education Foundation’s first annual Grown-Up Spelling Bee, held in 2016. Kil-Bee’s Revenge of the Words captured the title (Kilby Shores), with Alpha Bees as first runner-up (Pioneer & Oakland). Here are some photos from the BUZZ-tastic night! NOTE: Contact Bethanne Bradshaw for the 2018 event. How Does SPS Announces Schedule Changes? Suffolk Public Schools will consider opening schools on a two-hour delay, due to inclement weather, hazardous conditions, power outages, or other emergency situations. Bus pick-ups for all students would begin either one hour or two hours later than normal pick-up times. “Delayed Opening” means that any before-school child care will also open under the same delay. Elementary student early drop-off would be delayed until 10:30 a.m. Breakfast would not be served on either delayed opening schedule. Lunch would be served. Dismissal time and after-school activities would remain the same unless otherwise noted. Find out bus schedules, orientation dates, school supply lists, and more. Click on the headline to open this post. Then click here for Back-to-School Central information page.